"...we would have declared war on them." "If any foreign nation had done this to us, we would have declared war on them." Hansen writes that "mountaintop removal yields only 7 percent of the coal mined in the United States, less than U.S. coal exportrs, so the practice could be prohibited without damage to the country's energy supplies." PS: Robert Kennedy Jr. is right about this, but I don't think he can ever really live down his autism-vaccine article published in Salon. PPS: I just learned about the 2011 documentary "The Last Mountain," but haven't watched it yet. One of the criticisms of geoengineering via solar radiation management (SRM) -- such as putting small reflective particles into the upper atmosphere -- is that once you come to rely on it to stop global warming, you are stuck doing it forever. A recent JGR paper by Jones et al shows how fast temperatures return to the pre-geoengineering trend -- just a decade or two. The top figure to the right are the results of 11 climate models where 50 years of SRM geoengineering to counter a 1% per year increase in CO2 concentrations was halted after the 50th year. In the first decade after stopping, temperatures shot up by up to 1.5°C, and over 2.0°C over 20 years. The second figure is for precipation under the same scenario. Of course, this would be a disaster for lots of species, who are going to have a hard enough time keeping ahead of gradual warming, by heading (if they can) toward the poles or higher in elevation. In this picture they'd see no reason to migrate for the first 50 years, then be stuck when temperatures spiked upward. Not only that, but we'd be creating a high-CO2, low-temperature world, the likes of which Earth and its ecosystems have never, ever experienced. It's unlikely our descendants are going to appreciate the never-ending geoengineering project we could commit them to. In fact, probably no generation in the history of mankind is going to be as reviled as much as ours will be, for having known about the dangers of manmade climate change but choosing to do nothing about them. I wonder what they will call us -- "heedless" seems far too kind. PS: This result is similar to that of Ross and Matthews that I used in a recent Yale Forum article. "You will hear politicians and others say something like, "We have a plan. We will reduce emissions 25 percent by 2020, 90 percent by 2050." Or they will give some other numbers. But the numbers are meaningless, as you can easily prove. Just ask them this question: "Are you going to continue to use coal, and maybe even permit another coal plant to be built?" If they say yes, then ask them how they plan to convince Russia and Saudi Arabia to leave their oil in the ground. When they tell you that they are going to solve the problem via a "goal," "binding target," or a "cap," you know they are lying. Yes, lying is a harsh word, so you may instead say "kidding themselves." But I expect that one day your more perceptive grandchildren will say that you let the politicians lie to you." The bad news is that Mann’s misrepresentation of himself as a Nobel Laureate and Combs-Greene’s inept management of her case means that all parties have racked up significant six-figure sums just to get back to square one. (Emphasis mine.) I don't see how they would know what Mann has spent on lawyers, but they seem quite aware of what's come out of their own hide. No wonder they are shilling so hard for donations. In an otherwise not-so-great video on climate change, Bill Nye includes this labeling of the major greenhouse gases. This is great -- a visualization of ocean currents around the world, from June 2005 to December 2007, made by NASA's Goddard Space Flight Center. Today the Hadley Centre posted their value for the November global temperature anomaly: +0.596°C, the third-warmest November in their records going back to 1850, behind 2001 and 2005. So far they have 2013 as the 8th-warmest year, with 2010 being first, 2005 second, and 1998 third. NCDC's calculation of last month's global temperature anomaly, +0.7780°C, is also the warmest November in their dataset, in agreement with GISS's finding. Thanks to the record warm November, 2013 is now on pace for the warmest non-El Niño year on record, according to meteorologist Eric Holthaus of Q magazine. The years 1998, 2005 and 2010, which were all warmer than 2013, were all El Niño years. Kitten Sneezes Are Worse Than Hiros! Now the inhumanity has devolved into cat-hating as well. In the face of intense criticism, John Cook put forth at the AGU meeting a unit for those who prefer a "cuddlier" figure for the amount of heat trapped by global warming -- the "kitten sneeze." However.... That's a brutal number of sneezes per kitten, as I will now prove. While it's unlikely the world-at-large has as many cats per capita as does the U.S., this figure doesn't include feral cats, wild cats, lions or tigers, so let's take it as the world average. With a global population of 7.13 billion people, the number of estimated cats on the planet is 2.15 billion. Why does John Cook hate little Oliver? Domestic cats live about 16 years, and are kittens for roughly 6 months. 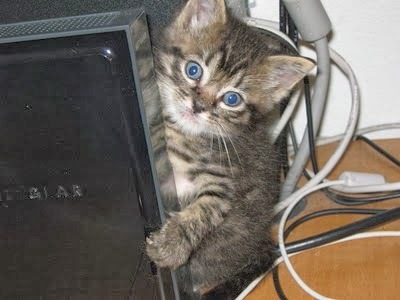 So right now there are about 67 million kittens on the planet. Thus, each kitten would have to sneeze 110 million times a second to equal the amount of heat trapped each second by global warming. I'm sorry, but any kitten that sneezes 110 million times a second is not going to last more than a few microseconds, and that's just cruel. So instead of the insensitivity and inaccuracy of comparing global warming to the horrific death and destruction of a major world city and its inhabitants, Cook is comparing it to the near-instantaneous vaporization of millions and millions of the cutest beings on the planet, bar none. This isn't an improvement an all -- a unit that imagines the wanton mass destruction of the world's entire population of innocent kittens is perhaps the only unit that is worse than the Hiro. Questioning climate science is one thing, and National Review has done plenty of that. But I'm still a little surprised that apparently they aren't embarrassed at having readers who believe that global warming is "the greatest scientific scam of all time." Or, as the chemical engineer puts it, "nonsense." In fact, NR is so far from being embarrassed that they put these letters front and center on their website as a call to arms. Wasn't there a time when a serious publication would quietly bury correspondence like this? Sure, every magazine has some lunatic readers, but you generally want your public face to be a little more serious. The stuff you publish should at least have the veneer of respectability. Either that's hopelessly old-fashioned thinking, or else National Review really does believe that climate change is just flatly a scientific scam. I guess I don't read them closely enough to know which. But I was still a little taken aback that they seem actively proud to trumpet stuff like this. Shouldn't they be leaving this kind of thing in Glenn Beck's capable hands? I suppose if you need to raise lots of money -- and NR does seem to be advertising pretty hard for it lately -- you're going to need to appeal to those who are emotional and heated about the issue, rather than those who are knowledgable and/or reasonable. For awhile National Review was letting Jim Manzi write some sense about climate change in their magazine and blogs, and this past March Oren Cass -- Mitt Romney's domestic-policy director during his presidential campaign.-- wrote an article for them, "The Next Climate Debate: Conservatives should accept the science and focus on policy." Either those didn't stick, or they are cynically taking whatever position gets them out of their legal jam. I never once encountered Watts at the AGU meeting. I never saw him, never looked at him, never noticed him, never had the slightest thing to do with him, wouldn't know he existed if he hadn't written about me on his blog. Frankly, I was pretty damn busy covering the conference to notice who was watching over me. I'm still tired from working 15-hour days there. My beat is science, not people. I'm not interested in blog fights. I'm still weirded out that Watts was stalking me, sitting near me in order to watch my reactions to the talks instead of paying attention to them. All the while afraid to introduce himself. Watts' schtick is lying about people [lie #1, lie #2], then pretending he's oh-so-magnimious for taking it all back. The man is a creep. He clearly could not understand the talks at AGU (he doesn't even have a B.S., you know), and so had no other choice but to write about people instead of science, in order to justify his taking advantage of his readers' largesse. Posting pictures of slides, as if that's some kind of meaningful coverage. Imagining he's so important that he's scaring people. Just creepy. Perhaps he should have stayed home and worked on that paper he so loudly and obtrusively hawked about US surface stations, which after all this time never has made it through peer review. Like Morano, Watt is the kind of creep who somehow thinks attacking people means attacking science. But if either of them knew anything at all about science they'd know that has never worked, nor can it ever. Which is precisely science's strength, and why no "open letters" or red-bold email addresses will ever make any difference. From his book Storms of My Grandchildren, Chapter 1. The legal threats faced by scientists aren't usually about their data. There was a panel at the AGU meeting titled "Facing Legal Attack: Scientists Tell Their Stories," and I wanted to bring out a comment received at my article at the YFCC&M. A scientist who is threatened by a request for his data is not a scientist. As far as I know, no scientist has received a legal action asking for their data. The closest might be Joe Barton's request to Michael Mann, Ray Bradley, and Malcolm Hughes asking for (nearly) their entire professional life history, but it's unclear what legal authority Barton possessed. But on the panel, Andrew Dessler offered this: he told of how he was invited to appear on Frontline after publicity from a FOIA request for his emails came from Chris Horner at the American Tradition Institute. Dessler said that after Horner saw that Dessler was on Frontine, Horner filed a second FOIA looking for emails between Dessler and Frontine. As I replied at the YFCC&M, it is difficult to see how that those would be of any relevance whatsoever to any of Dessler’s work -- instead it looks like a pure fishing expedition. Are Large Artic Melts Causing Part of the Hiatus? Update 3/3/14: I just noticed that the table below contains a spreadsheet error. The top number in yellow (avg) should be 42°C; the stdev stays the same. So the data is showing just slightly cooler global temperatures, but with more variation. I am intrigued about Judith Lean's hypothesis that large summer Arctic sea ice melting is affecting global winter temperatures, which I wrote about for YFCC&M here, and which Lean described for me in this short interview. Winter average global temperatures are lately running far below those of other seasons, and seem somewhat correlated to the previous year's September melt. I'll have to calculate more numbers, but there does seem at least the possibility that some negative feedback is suppressing global average temperature compared to what they would be otherwise, which might be a portion of the hiatus. It is reassuring to see how far I've gotten under the skin of Anthony Watts -- I must be doing something right. Does anyone else get the impression his "coverage" of the AGU meeting seems to have been mostly about lurking around looking at people and daring them to look back, while imagining they actually care? If Appell isn’t the one who grunted when the WUWT slide came up, I’ll certainly take his word for it. Maybe it was somebody behind me I couldn’t see or maybe it was somebody stifling a cough. All I know is that I heard something at that time that sounded like a grunt, and I thought the most likely candidates were Appell and Somerville, since they both have expressed strong disdain in the past for climate skeptics, and with Appell, me in particular. Actually I had my digital recorder running for the entire lecture, sitting on the chair right beside me. I've only listened to a snippet of it -- my notes were sufficient for writing my article on YFCC&M -- and while the speaker sounds quite distant, I suspect it would have picked up any noises close to me. But I'm rather busy right now, and I know the answer anyway. PS: An alias is, of course, the only way many people can comment on Watts' site, otherwise you are censored for not toeing the denier line. This is common knowledge. AGU13: "Facing Legal Attack: Scientists Tell Their Stories"
I have one last piece up at the Yale Forum on Climate Change and the Media, covering the Thursday panel "Facing Legal Attack: Scientists Tell Their Stories" featuring Naomi Oreskes, Jeff Ruch, Kevin Trenberth, Michael Mann, Andrew Dessler, and Ben Santer. Young scientists should expect such travails, several of them said, and realize that help is available and that there is strength in numbers. And that one’s laboratory or academic management is not always of much help. “The most important thing you can do is talk to people who have been in the same situation,” said Naomi Oreskes, a historian of science now at Harvard University. Science magazine was threatened with a lawsuit in 2004 after publishing an article by Oreskes, and, she said, she felt threatened by extension. The threat never did materialize as a lawsuit, and in the long run her career was actually strengthened, she said. She became friends with Science editor-in-chief Donald Kennedy, wrote a book that sold well, and got invitations to publish elsewhere. “But I wouldn’t wish it on anyone,” she said of the experience. GISS global anomaly = +0.77 C.
That's the warmest November in their records, and the 6th warmest month. Reporting, commentary, and analysis on climate change. Yale Forum postings during 'AGU Week' in San Francisco. All postings this week (Dec. 8-12) involved the 2013 Fall Meeting of the American Geophysical Union. With contributions from three Yale Forum writers attending the meeting ... the surface is barely scratched, given the enormity of the meeting and the attendant goings-on. Hansen: 2 Degree C Goal for Global Warming 'Disastrous' (Bud Ward). Super Typhoon Haiyan: A Hint of What’s to Come? (Andrew Freedman). Bruce Lieberman: When Measuring Climate Change, ‘What’ Do You Measure? Did Obama Get a Selfie Copy from the NSA? Do you suppose that when the Danish prime minister asked Obama if he wanted her to send him a copy of their selfie, he said, "Thanks, but I can get one from the NSA." According to this, Michelle Obama wasn't nearly as put-out as she looks. Denning's talk at a Heartland Institute conference is not to be missed. Anthony Watts can't even tell the truth about the little things. Heard David Appell and Richard Somerville who were sitting near me both grunt when WUWT was displayed. which is an outright lie, concerning my reaction. Frankly, I couldn't care less -- and, let's note, the presenter, presented his site as an explicit example of bad science, as no Maunder Minimum-like changes in the Sun are going to cancel this century's global warming. And if Watts can't tell the truth about the little things.... I'm more skeeved out that Watts is secretly monitoring my reactions to the talk, instead of paying attention to the speaker. By the way, Lean's talk was really fantastic, showing the data for all the relevant climate factors, and stressing that surface temperature is a function of more than CO2. Bud and Bruce are also worth checking out. James Hansen's talk here today was cancelled, apparently due to a schedule conflict. A lot of people here were looking forward to it.... Not sure if it will be rescheduled. From John Abraham and Dana Nuccitelli in The Guardian: "Global warming is unpaused and stuck on fast forward, new research shows." New data for ocean heat content for the third quarter was just posted by NOAA. It shows another large increase for the 0-700 meter layer. Compared to a year ago, 0-700 m OHC was up 0.90 x 1022 Joules, which works out to 285 terawatts, or 0.56 W/m2 over the Earth's entire surface. Comparing, the 0-700 m heating in the last year is twice the 15-year trend of 0.45 x 1022 J/yr, and 3.4 times the trend since 1955. 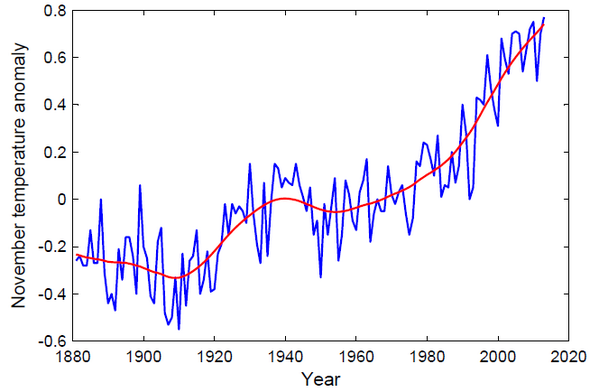 An acceleration of warming? The figure for the 0-2000 m region hasn't been posted yet. Click here to access the web version of this message. Log in to View Fall Meeting Content Now! Fall Meeting Virtual Options Offer 3 Ways To Participate - From Wherever You Are! Live Streams and Videos On-Demand: Watch live streaming and recorded Fall Meeting sessions. Nearly 100 sessions (almost 600 presentations in total) will be available live and on demand. Register and begin viewing now. 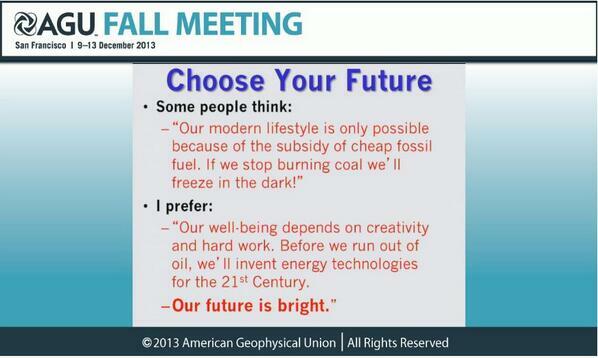 Be sure to use code AGU13 for free access! Remote Viewing Site: Gather colleagues to watch live streaming or recorded sessions together and discuss the exciting science of the Fall Meeting in your office. Register as a remote viewing site to receive an electronic packet of materials to help your organization participate. ePosters: View thousands of ePosters and post comments about the research.